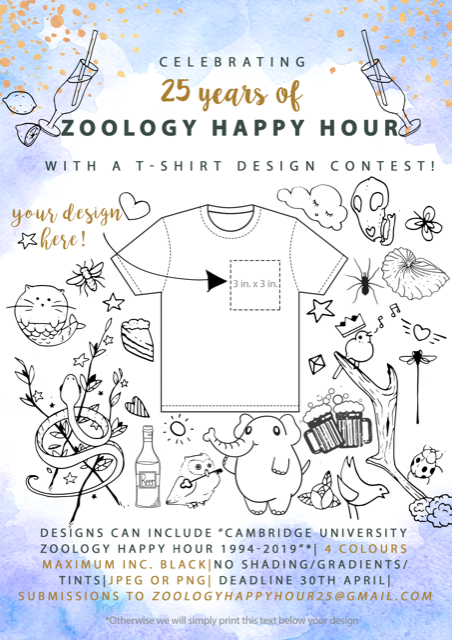 We the Happy Hour team have an exciting announcement… This year is the 25th anniversary of Zoology Happy Hour! To celebrate, the department is holding a Happy Hour Spectacular on Friday 27 September 2019. How does becoming immortalised as part of Zoology Happy Hour sound? This is your chance! As part of the celebration, we are launching the Happy Hour T-Shirt design competition. Open to all members of the department, past and present. Just send us your T-Shirt design (4 colours max) to zoologyhappyhour25@gmail.com to enter. The T-Shirts will be on sale at Happy Hour and around the department in September 2019, and a portion of the sales will be donated to a new Zoology research and support fund.